Learn how to copy and paste GIF images. These methods will help you if only one static frame of animated image is downloading in your computer. Animated GIF images are very useful when you want to show a small animation in webpages. The Internet is full of great gif images and a lot of them are available even as free animated gifs. You can just download them and use on your webpages. But when you copy or save an animated gif, all you get is a static frame from the animated gif file. You need to know the right method to copy and paste an animated gif if you want to get hold of them and use in your website. In today’s article, we will learn how you can copy any animated gif into your computer and then paste it as animated gif in your target webpage. STEP 1: Go to the webpage where animated gif is appearing. STEP 2: Go to Settings of your browser and select Save Page (in Firefox) or More tools > Save page as (in Google Chrome). A box will appear, just save the page in whichever location you prefer. STEP 3: Open Windows Explorer or File Explorer and navigate to the location where you had saved the page. You will see that a folder has also been created with the same name as that of the saved HTML page. STEP 4: Open the folder and search for *.gif —the results will show the animated gif that you wanted. STEP 5: You can paste the downloaded gif image in an MS Word file, email or in a webpage. STEP 6: In MS Word document, go to Insert > Picture to embed the gif image. But MS Word can not show animation if gifs. If you really to embed animated gif in MS Word, then you will have to save the Word document as a Web Page. When you will open this web page document (created by MS Word) in a web browser, you will see the animated gif in action. SEE ALSO: Learn how to convert a video into animated gif in our Internet tricks archive. STEP 1: Go to the webpage that is displaying the animated gif you want. STEP 4: Take right click in any empty area and select Paste. Instead of right click, you can also use CTRL+V to do the paste operation. STEP 5: Now the whole animated gif (along with animation, of course!) has been saved in your computer. You can insert it in a Word document, email or webpage as you want. 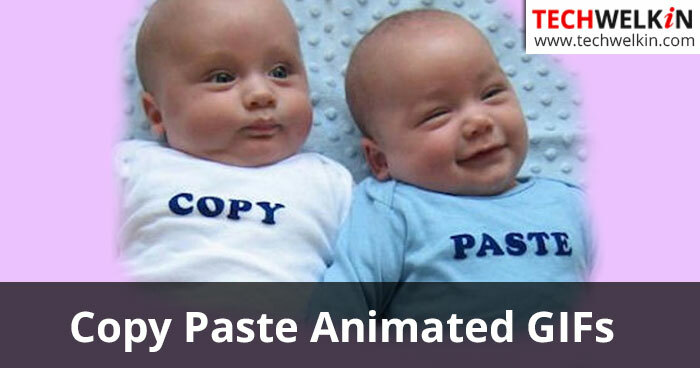 We hope that this article on how to copy and paste an animated gif was useful for you. Should you have any questions, please feel free to ask in the comments section. We will try and assist you. Thank you for using TechWelkin!